Okay, I know I said I’d do horns next. But I decided I wanted a layer of cloth skin on the head first. 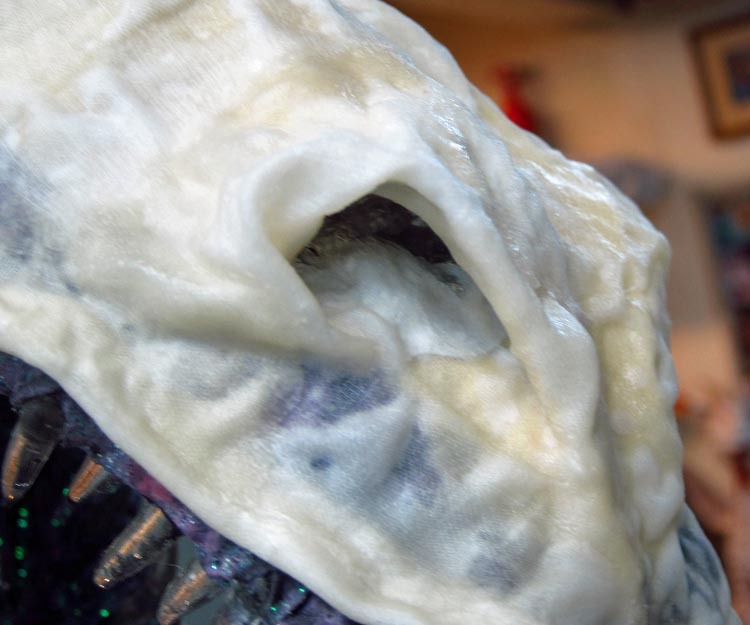 It would be a much better surface for using hot glue to apply the horns. So a quick cloth mache on the face. I always fold the cloth to use for eyelids. I usually do under the eyes first. Then over. 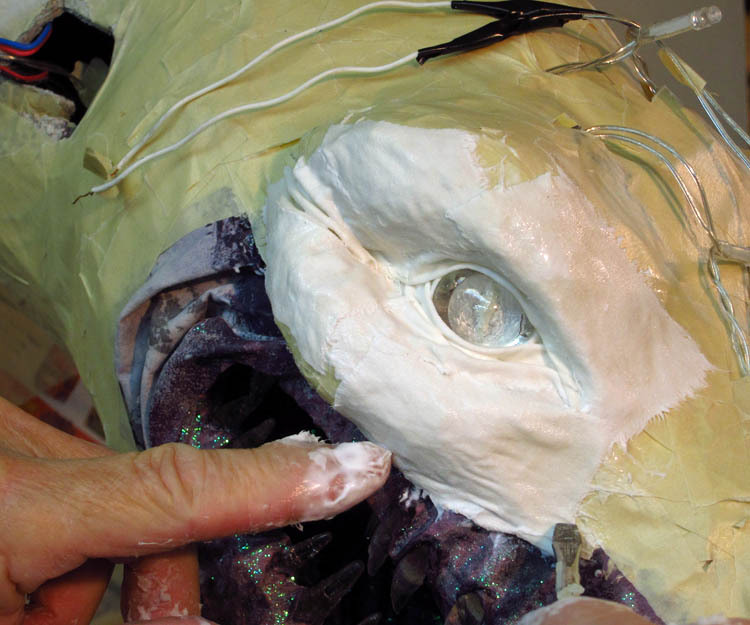 The nice thing about wrapping eyes with the cloth is that wrinkles occur naturally adding a touch of realism. I fold a long strip of cloth for lips, then fill in above them with pieces of cloth. 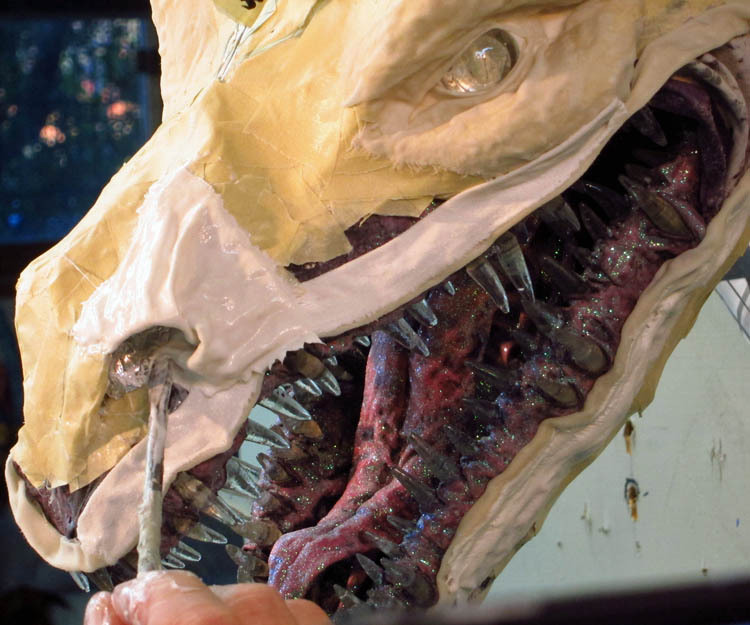 I push a large square piece of cloth into the nose and piddle around until I get the shape of nostril I like. I’m very happy with the way the eyes look with the lights off. 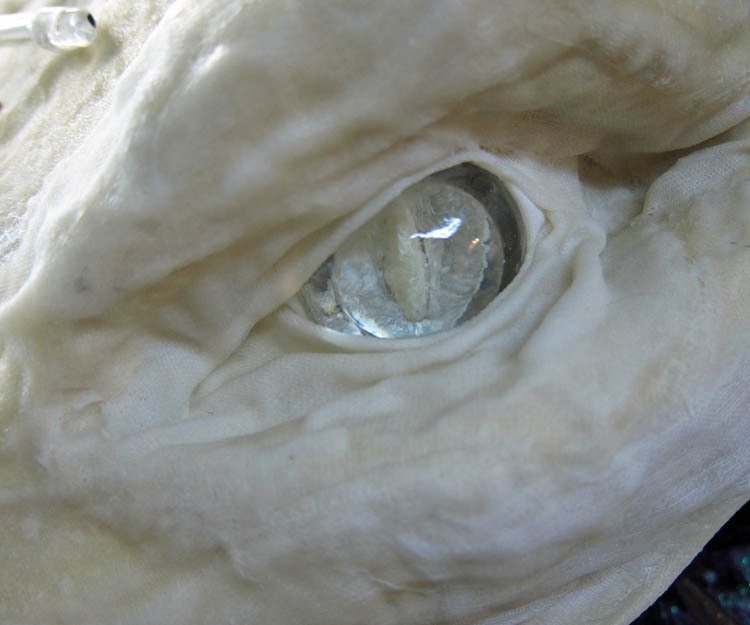 The clear cast resin with irises and pupil ground from the back with a Drumel have a nice look to them. Okay, horns next. I promise. 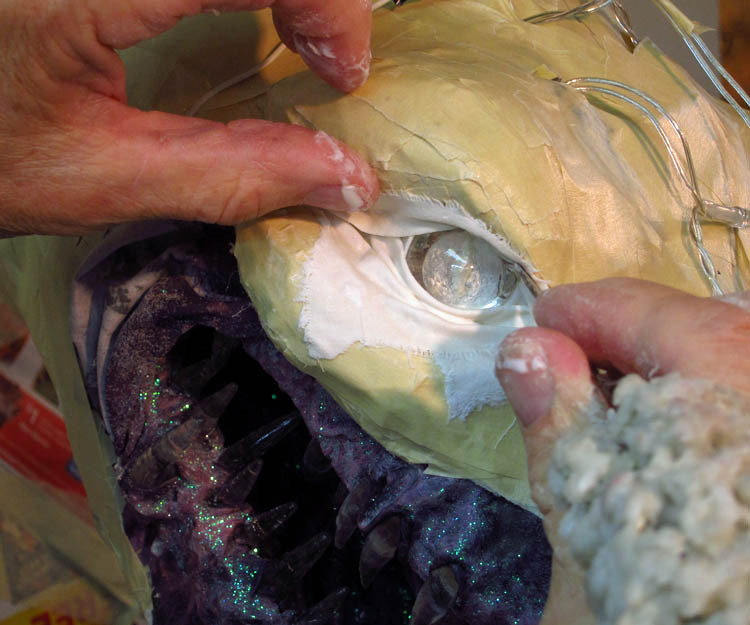 This entry was posted in Paper Mache Ice Dragon and tagged arts and crafts, cloth mache, dragons, fantasy, paper crafts, paper mache, paper mache instructions, paper mache recipes, papier mache, sculpture. Bookmark the permalink. Wow, just look at those eyes! This guy’s going to be absolutely amazing when he’s finished. Thanks as always Stella! Hope all is well. Thanks. Yes, I’m well. Even managed to get a blog post up recently in amongst all the work madness. 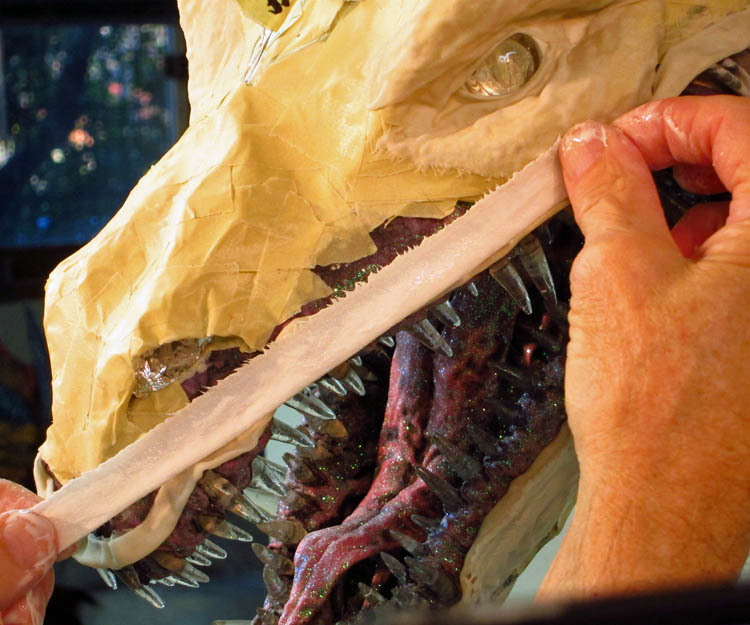 I love seeing the creation process. Dragons are one of my favorite subjects and this is both fascinating and beautiful. Yes, there are unlimited dragon options. It’s why it’s hard to stop making them! Thanks Pamela! The eyes and nostrils look so amazing, really makes him real. I’ve learned so much just from your posts on this guy! Thank you so much for the nice remarks about my techniques Donald! You are very kind. I came across your art from another site and all I can say is… WOW! Your work is absolutely breathtaking! Is there a link anywhere to know the recipes and materials you use for your mix and what would you recommend to waterproof your pieces once complete? I just subscribed to your YouTube channel and I am so excited to see each video! Glad you like the work Jennifer! I don’t really have many recipes. 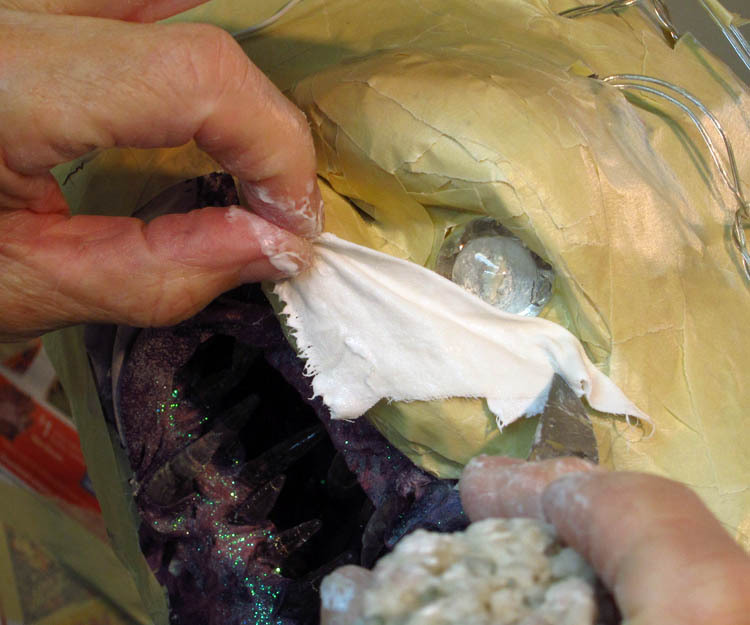 I use flour and water (in about equal measure) for the paper mache paste with the newspaper, and I use white glue (I like Elmer’s) full strength for the cloth “skin”. I have never found a topical sealer that works for paper mache. The closest I’ve been able to come to helping with the weather is exterior grade white glue and paints labeled “exterior” enamels. I don’t believe that paper mache will hold up permanently. It’s just the nature of paper to absorb moisture from he air. Good luck! Hello Noemie. Sounds like you are having a great time! It’s very nice of you to do such a project with your son. I use old bed sheets for my “cloth mache” skin. I never check the tag so I don’t know what blends I’m using. I just prefer the oldest, most worn sheets I can find. The more worn the more malleable it will be. Of course I dip it in white glue (no water added). I have to warn you however that the “smooth” finish is a bit of an illusion. It will dry with air bubbles and some wrinkles. I think that it works great for dragon finishes, but don’t expect really smooth surfaces. Still, it will be much better than plaster cloth which is very heavy and does have an extremely rough surface. Good luck! Thank you very much 🙂 you made my son’s day by responding to us 😀 I have a lot of rags somewhere, I will sort through them 🙂 Do you have any tips to share on attaching the head on the neck?? Im a bit worried it might not hold on very well 😀 Thanks again! I just use masking tape to hold the head on the neck until I do my cloth mache skin. I’ve never had any trouble with that not working. Good luck!